New Delhi: The National Democratic Alliance (NDA) government is working on creating a common agricultural market that will improve the lot of farmers and the efficiencies of India’s notoriously inefficient farm-produce markets. The government put out a model law proposing a fundamental reset in the way agricultural markets operate on 24 April. It proposes to replace existing fragmented and over-regulated markets for agricultural produce and allow farmers a wider choice of markets beyond the local mandi or wholesale markets. “Our goal is to create a one-nation, one-market model for farmers, similar to what GST (the goods and services tax) is to taxation… a model of creative disruption for an efficient marketing system,” said Ashok Dalwai, additional secretary at the agriculture ministry and head of the committee that drafted the new model law on marketing of agricultural produce. Agriculture marketing is a state subject and the centre can only propose a blueprint. The eventual rollout will depend on the state governments. A model Agricultural Produce Marketing Committee (APMC) law was first proposed in 2003 but made little progress. The process was set in motion after Prime Minister Narendra Modi launched an electronic National Agriculture Market (eNAM) platform in April 2016 and later set an ambitious target of doubling farm incomes by 2022. This was followed by a model law on land leasing (making it easier for tenant farmers to access credit and insurance) and another on agriculture marketing. A law on contract farming is in the works. The current thrust on connecting farmers to markets complements the government’s earlier effort to reduce growing risks in agriculture through a revamped crop insurance scheme and massive funding of irrigation projects. Dalwai added that the reform process beginning in 1991 largely ignored agriculture—a sector involving 140 million families and the largest private enterprise in the country. “We needed a paradigm shift in policy goals, moving beyond production to all aspects of post-production with the objective to raise farmer incomes,” he said. The goal of the eNAM platform is to connect regional mandis, helping farmers access markets across the country. So far, 417 mandis in 13 states have joined the eNAM platform after amending their APMC Acts to fulfil three requirements—a single statewide licence for traders, a single point of levy of market fees and the launch of online trading. The new model law on agriculture marketing adds a range of reforms to the required amendments for joining eNAM. These include allowing setting up of private markets, direct sale of produce by farmers to bulk buyers and capping market fees and commission charges payable by a farmer. Most importantly, it withdraws the power to issue trading licences from the mandis—managed by a board of traders—and vests it with the state’s director of agriculture marketing. Several states seemed to be willing to sign on. 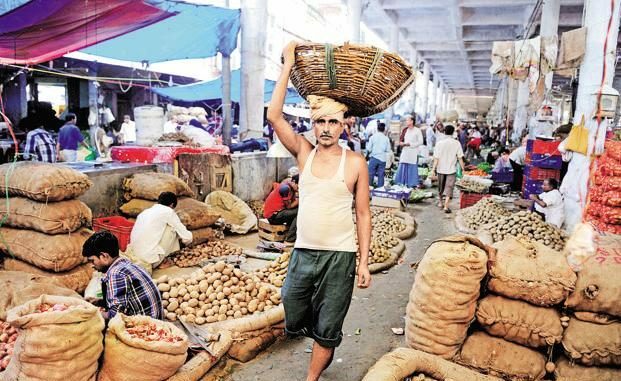 States such as Andhra Pradesh, Chhattisgarh, Gujarat, Karnataka, Maharashtra and West Bengal have amended their APMC laws, allowing the setting up of private market yards and direct sale of produce by farmers. Similarly, 21 states have allowed a single-point levy of market fees across the state, allowing a trader to purchase produce from a farmer anywhere within that state. And 15 states allowed the delisting of fruits and vegetables from APMCs, making it possible for farmers to sell these outside regulated markets. An expert said that these legislative changes are yet to change ground realities. “Many states have amended their marketing acts but are yet to notify rules. Maharashtra, for instance, delisted fruits and vegetables a year back but did not notify rules following pressure from the powerful traders’ lobby, while Madhya Pradesh has set an entry barrier of depositing Rs1 crore for a unified state licence,” said Pravesh Sharma, former director of the Small Farmers’ Agribusiness Consortium, a specialized agency under the agriculture ministry, and currently a fellow at the Delhi-based Indian Council for Research on International Economic Relations. Which is why the centre’s efforts are important, he added.